The Tabla, also known as the Doumbek, is an ancient instrument of the Arab World, and is rarely absent from any celebration. This goblet-shaped drum is used folk, popular and classical music throughout the Middle East and neighboring countries. Many around the world are drawn to this captivating instrument. With Rhythms of the Arab World Volume 1, world-renowned percussionist Karim Nagi will teach you the essential technique and rhythms so you play with live bands, drum circles and dancers. Karim Nagi is a native Egyptian teacher and performer of Arab music and dance. 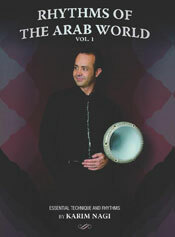 He is an internationally known percussionist who specializes is the Egyptian Tabla (a.k.a. Doumbek, Darabuka), the Riqq (tambourine), as well as frame drums and finger cymbals. Includes musical notation of rhythms. Language: English, 67 minutes total.